“Mac, I can hardly wait for night-time to come,” Ian said, gathering a handful of berries. “Oh? Why is that?” Mac plucked a few ripe ones. “All right, but this is the last time.” Mac sighed. “A little girl named, Nancy, lived in the city. Once a week her mum took her to the zoo to see all the animals. Her favorites were the penguins. They’d walk around, going from cage to cage. Nancy loved the camels too. She spent a lot of time watching them walk about. She giggled when she saw their humps wiggling back and forth. Her mum took her to see the polar bears and the hippos. When they got to the penguin area, Nancy clapped her hands. She was so excited. The penguins slid down slippery slides into the water and then swam around in circles. 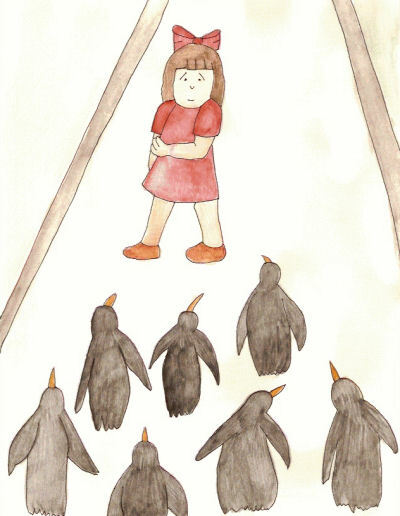 Nancy loved the way the penguins waddled and ate fish. “Not even her sweets?” Ian gulped and licked his lips. “Maybe they thought she was a fish. Maybe they were dreaming too,” Ian said. “That’s scary.” Ian rubbed his arms and grabbed hold of his striped tail. “Did she ever go back?” Ian squeezed his tail. “Yes, she did, but when her mum said it was time to go, it was time to go and Nancy didn’t argue with her ever again. There, was that a nice story?” Mac looked up at the stars. “Thank you, Mac. I’m glad there aren’t any penguins here in the woods.” Ian curled up in a ball and went to sleep. Mac did the same.